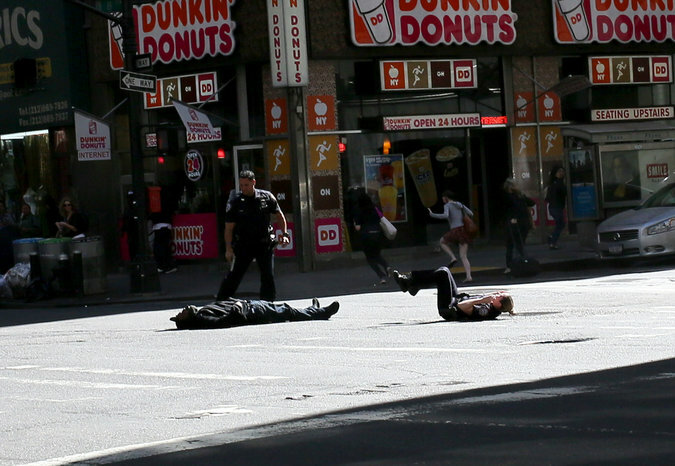 In front of dozens of witnesses, on May 13th in Manhattan, a white police officer shot and killed a black man in the middle of 8th Avenue. Was this another case of “black lives don’t matter”? In order to prove a case like this, attorneys must become masters over their evidence. Hours upon hours must be spent reading documents, reviewing forensic reports, and studying video evidence. Forensic reports and surveillance videos, however, are not unpredictable, that is, they won’t change with time. One very unpredictable piece of evidence, however, is the eye witness. And not only can the evidence he or she provides be unpredictable, but witness accounts of events are often dramatically wrong. The above two unrelated witnesses were feet away from the shooting and both gave shocking and similar accounts of what they saw; essentially an unarmed black man was gunned down by white cops while handcuffed and running away. With tensions as high as they are right now regarding police shootings, why have there not been protests, rallies, or riots stemming from this particular shooting of a black man by a white cop? Simple: because both witness accounts were completely wrong; and this happens more often than one may think. What actually happened the morning of May 13th is that the suspect, David Baril, attacked one of the officers in the head with a claw hammer. As that officer attempted to get away from the attack, after being struck several times, her partner drew his weapon and shot the suspect. The reason there are no protests or riots is because the entire attack was captured on surveillance video. When this video was shown to the two mistaken witnesses, they were both shocked and embarrassed for having given such an incorrect account of the events. The National Center for Audio and Video Forensics has dealt with similar instances of witnesses not remembering the details of an event correctly. In one such case, NCAVF was helping to represent a Sheriff’s Deputy who was falsely accused of falsifying a police report. A witness to the event gave contradictory accounts of what happened. The witness’s testimony on the stand was completely different from her account of the events given to investigators just a few months earlier. The video evidence NCAVF evaluated and enhanced for the case showed that the witness’s account of the events on the stand was wrong (her recollection of events given during the prior interview were accurate). One lesson from this particular case is that had the prior interview been recorded, it would have been available for playback during the trial. In another case, NCAVF evaluated security surveillance footage of a fight in a parking lot. The detective who initially viewed the surveillance footage stated in his police report that of the several people seen in the video, it was specifically the suspect who punched the victim, knocking him out cold. The public defender working the case had NCAVF appointed because he was not convinced. He wanted the video analyzed by an expert. NCAVF’s evaluation determined that the surveillance system was on a motion-detection setting. Therefore the two seconds just before the “punch” that led to the victim being knocked out was not recorded. Thus, it was impossible for anyone to have seen whom it was that actually punched out the victim. Clearly, the detective filled in this memory gap while writing his report and assumed it was the suspect, who was already in custody, that delivered the punch. NCAVF was also involved in a dramatic case of a gang-related stabbing. One of the prosecution’s key witnesses had two very different narratives of the events. When originally questioned by detectives, the day after the stabbing, the witness, who was good friends with the victim, was very clear that she never saw a knife. On the stand, at least a year later, however, the witness had a much different account. After having so much time to replay the events in her mind, her testimony on the stand was that she not only saw the knife, she saw it in the accused’s hand. Initially, the witness was very believable as she was young, soft spoken, had a sweet demeanor, and did not appear to have any gang affiliations herself. But when the defense read back her own words taken the day after the attack, she became visibly upset. She seemed genuinely concerned over her wrongful account of the events; not because she was caught in a lie, but rather because as Dr. Loftus put it: she likely filled in the details with her own expectations as well as a desire for justice over her friend’s stabbing. In a case such as this, it would likely be much more powerful to the jury to play back the witness’s earlier account of the events rather than simply reading a transcript. It is a fact, witness accounts of events are often dramatically wrong. Simply put, human memory can be fallible. Witnesses will often see or remember the details as they want to, or as their own emotions will lead them to. Witnesses will fill in the gaps with their own desires, hopes, or expectations. Attorneys must always utilize the video and audio evidence and any other evidence available for a case in order to show what really happened. What’s more, when interviewing a witness, attorneys, police, or investigators should always record the interview and have that recording available for playback in court as the actual trial may be months or even years later. Having such a recording may be the best evidence that can protect you from witness accounts that harm your case.